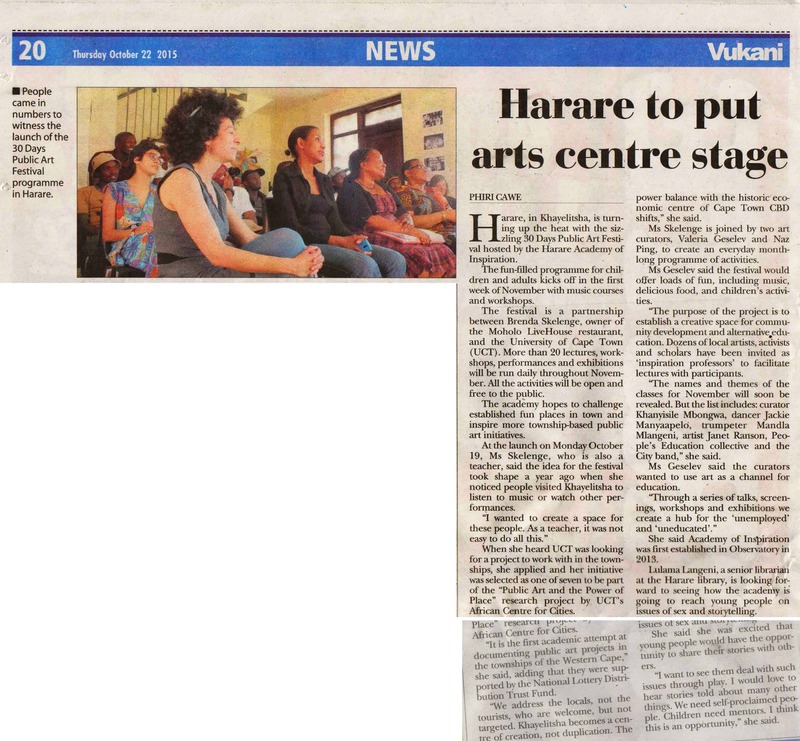 The Harare Academy of Inspiration is one of the seven public-facing art projects being supported by the ACC as part of Public Art and the Power of Place. The curators have the following to say: ‘The Harare Academy of Inspiration is an ambitious public art project, turning a small restaurant in front of Harare Library in Khayelitsha into 30-day arts festival. The daily inspiration classes are facilitated by artists and open for all for free. The name academy references a suggestion for looking at art as a channel for alternative education system. The timing couldn’t be more relevant to the public discourse about ‘de-colonization’ of local academic institutions. Symbolically, the day The Inspiration Academy programme was launched, started the demonstrations of UCT students protesting the high tuition fees in South African. While the students joined in a movement to change the old-fashioned mind set, The Harare Academy is establishing a new kind of university, re-inventing academia as a free space of knowledge traffic tailored for its environment. The list of facilitators, or inspiration officers as they are called in the project, local upcoming artists: curator Khanyisile Mbongwa (workshop in critical photography), activist Siddiq Khan (Mexican Revolution), trumpeter Mandla Mlangeni (Jazz); theatre-makers Zimasa May and Themba Baleni and choreographer Jackie Manyaapelo. The long list of classes will end with a grand-finale open air performance of big band, orchestrated by local jazz legend Louis Moholo’. See the attached document for the calendar of events. 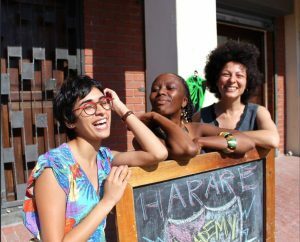 #1 The Harare Academy of Inspiration is an open college for free exchange of creative knowledge, based in the Harare community, Khayelitsha. Through the platform of an open university; a series of talks, workshops and exhibitions we create a hub for the ‘unemployed’ and ‘uneducated’. #2 The first semester of Harare Academy will take place during November 2015, with free daily classes in all that is inspiring. #3 All the lectures will be facilitated by guest speakers – artists, creatives, innovative activists in the community and around Cape Town. #4 The project re-imagines schools and community centres, providing all classes and ages the opportunity to sit in a dream classroom. Our aim is to create a new category of public space that encourages positive social interactions. We use multi disciplinary art to express contemporary notions and creative narratives around the practice of knowledge traffic in society. 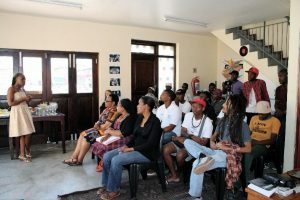 #5 The basis for the Academy of Inspiration is already set – Moholo LiveHouse has been active for over a year as an alternative institution for Harare community activities – music, poetry, screenings and political conversations. #6 This initiative is a part of ‘Public Art and the Power of Place’ research project by UCT African Centre for Cities. It is a first academic attempt in documenting public art projects in the townships of Cape Town. #7 To make a month long programme of workshops and lectures possible, we provide all that is necessary. To allow students and lecturers to be free to exchange skills, ideas and information, we cover all the costs of transport, equipment, materials and food. This support is possible via national lottery distribution trust fund. #8 We see this opportunity as a way to institutionalise an existing organic practice, with the vision of creating a prototype of a new community institution – one which pours a contemporary fresh meaning into the existing urban-planning category of libraries, theatres, museums and schools. #9 To get involved, choose a date in November and let us know what you would like to do. Please follow the project everyday in November 2015. 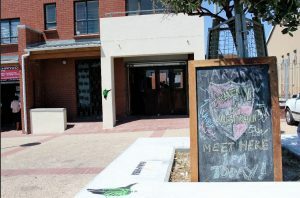 Moholo LiveHouse, 42 Ncumo road, Harare, Khayelitsha (opposite the Harare Library) and on Facebook. Power of Place was made possible by the National Lottery Distribution Trust Fund.